These fresh fruit desserts are easy and irresistible! They are easy to make in a moment and they can transform a boring, ordinary dessert into something special. If you have soft fruit such as raspberries, blackberries, redcurrants and blackcurrants it is very simple to prepare. This really is a dream dessert! Coulis just means "strained liquid" and is both singular and plural. You can make savoury ones with tomatoes and peppers too. Wash the fruit and remove the stalks. 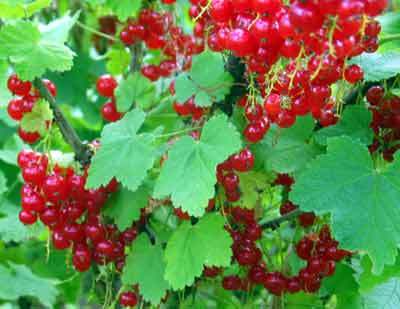 You don't really need to remove the flower stump from the other end in the case of redcurrants and blackcurrants - they add texture! Put the fruit into a heavy pan and add about half the amount again in sugar - enough to just about cover it over. Warm gently and stir constantly. Try not to break the fruit. When the sugar has dissolved into the fruit juice, take the coulis off the heat and let it cool. Put it into the fridge or somewhere cold to keep. You can spend time sieving or putting the fruit pulp through a mesh but I think it is not worth the bother for everyday desserts. Most fruits contain valuable fibre which it is best to use for the sake of your health. Obviously, if you are preparing a fancy dinner party, you may think differently! As "coulis" does mean strained liquid, I suppose the proper term for the fruit desserts here might be fruit compote. Fruit compote tends to be cooked more and usually has more sugar in it. Whatever the name, these fresh fruit desserts really are delicious and a most versatile way of getting more fresh fruit into your diet. They also do not need to be high in added sugar if you are using naturally sweet fruit and you are using them immediately, or nearly so. You can add other ingredients such as mixed berries. You can add a little lemon juice or orange juice. You can also add a dash of liquor, if that takes your fancy. Fruit berries which have been frozen can be made into coulis, too. Inexpensive frozen fruits are now widely available and they are a great alternative if you have no fresh fruit for making coulis. Frozen foods are often packed with vitamins because the time between harvest and freezing is usually short. Unfortunately, good organic frozen fruits are not yet so easy to find. Use it with yogurt, ice-cream, meringues or cream. You can add it to sponge puddings or pour some onto almost any simple dessert dish. Fresh fruit coulis or compote goes well with pancakes. Sometimes the slightly tart taste of a good coulis can complement the rich and over-sweet tastes of commercial desserts, making them more palatable. Most fresh fruit coulis will go well with chocolate desserts. Really you can let your imagination fly. They work well with so many other desserts. Add it to cake and serve it with cream. Pour some onto that nutrition-free party jelly for your kids. There are plenty of ways of sneaking a little extra fruit into children's desserts. Raspberry works well in any of these ways and is just delicious. You can also mix it in to yogurt drinks to add flavour. This is one way to use it that does require some straining - unless you like bitty drinks, of course. If you make your fresh fruit coulis with very sparing amounts of sugar, you can use them to go with meat such as pork, or in place of such Christmas staples as cranberry jelly. I haven't tried cranberry coulis but I'm sure it must be a wonderful one, full of the health-giving benefits which cranberries have. If you use coulis this way you must still remember that it is not a conserve. It will only keep for a few days at best. Keep unused coulis in the fridge or a cool spot. It doesn't keep very long but then it doesn't have to; in our house it just disappears! You can freeze it, too. If you have cash to splash and want a gourmet kind of coulis, gingered papaya coulis are available from Amazon! Can't say I've got around to trying them - but the next batch of redcurrant coulis I make will contain a dash of crushed ginger root. You can also make coulis from surprising ingredients such as basil. Have a look at this well-regarded book by Dorie Greenspan: Around My French Table: More Than 300 Recipes from My Home to Yours.